Cooking Class for Children with Nazlina. 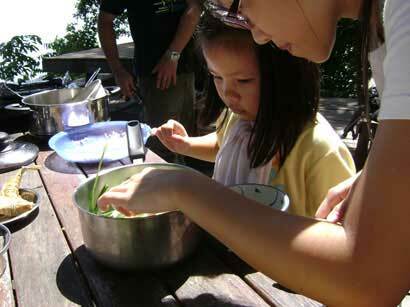 Even though you might think that children may be too young to learn to cook, we think otherwise. The skills that they are going to pick up will be useful for the rest of their lives! Children learn by observing how things are done. Might as well start them at a young age to learn basic cooking skills. Think of how lucky they are; they will learn the names of the spices and what the spices look like, smell like or taste like when some of their peers have never even heard of or tasted these ingredients. 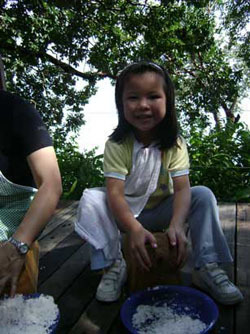 Kyling Saw from Penang is already an expert in baking cookies and cakes in her household. Therefore, it is only natural she was also very interested to learn about the spices in making chicken rendang in our children cooking class. She diligently grounded the spices manually until they become a fine paste. Looking at her working, one could see that a seriously competent cook was surely in the making. Yuki Tan from Hong Kong is our youngest student to date. She is a seven year old who was very curious with every step of the cooking process. Happy Yuki with her new "toys". She came with her older sister and parents and proudly took part in almost every activity we did. She scraped the coconut, grounded the kerisik, counted the number of peppercorns to be placed in the pot correctly and also cut the vegetables, guided by her father. 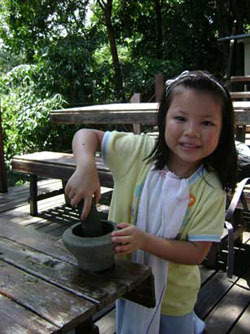 Yuki and her sister Charlotte placing the peppercorns into their saucepan. Nanda came to learn to cook with her mother. She is thirteen years old. She was so proud to be able to cook an elaborate meal and later enjoy it together with her mother. Even though this session was not a specifically children cooking class, Nanda benefited a lot by being in a group of caring adults. 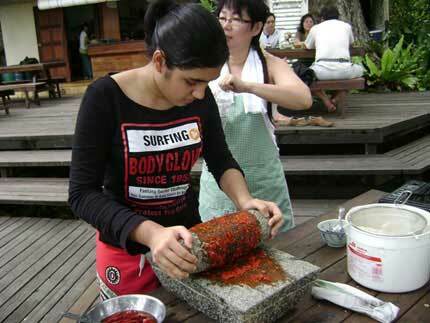 Nanda, 13 years old, hard at work with her chillies. 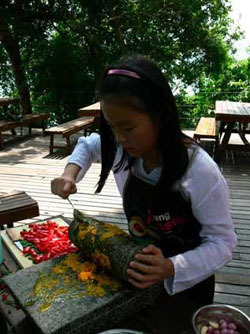 We also have request to supervise schoolchildren to do some outdoor barbecue as part of children cooking class activities. For this group, we plan to make scrumptious satay! Aha, everyone would get dirty by making their own sticks of satay. The tedious process of skewering the meat onto the bamboo stick would lessen considerably when it is done in gotong-royong spirit. 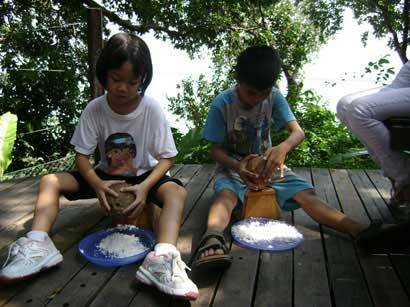 Children enjoying the task of scraping the coconut. You hardly have the opportunity to see this elsewhere. There is no minimum or maximum number of students. The terms for bigger groups are different from smaller groups. Please let us know what kind of program that you have in mind. Children coming together with their parents are very much welcomed. Please fill up the form below or send text messages (SMS) to Nazlina at +6012-4538167 to book your session at least two days before. How many people including you? Do you need transfer from your hotel? Please state hotel and room number for the transfer service. If this a team building exercise, please state your company's budget. See the fun photos of the cooking class here!